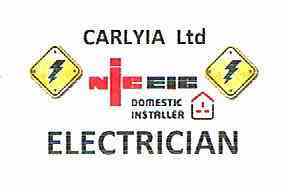 Carlyia Ltd - Electrician based in Fordingbridge, Hampshire. We pride ourselves on quality, tidiness, fairness, reliability and punctuality. The majority of our customers are repeat customers, proof of customer satisfaction. We have an open and honest approach when undertaking your instructions, and always provide you with a choice of what needs to be done and how this is to be achieved. We believe it is important that you remain informed and in control. We start with an assessment of your electrics identifying what is working, within permitted parameters and putting right what needs updating to keep you safe. All work will be certificated to ensure your peace of mind and compliance to Part P building control. Having attained "Qualified Supervisors" status through the NICEIC we have demonstrated competence through our qualifications, knowledge and experience of the building regulations to supervise/undertake electrical installations to BS 7671 standards.